I had to set my alarm for 7 so that we could get ready for our river cruise we had planned for that day. This meant that because of my “I’ll just have a few drinks as I can’t have a bit night” night, I got 3 hours sleep 🙂 . We all still made it to the docks and because of our Eurail passes, we got the trip up the river and back on the train for free. The first thing we did when we got on was ordered some coffee. The ferry stops at lots of little towns along the way so we had decided that we would get off at a town that Shoestring had mentioned if we were getting over the whole thing. The other option was to stay on the boat until ‘the end’ which was 6 hours after we started at a place called Bingen. When I was here last time, we were taking a train from Koln to Nuremberg and not long after we had left, we started following this amazing river with rolling hills on both sides that had vineyards growing all over them and then with every big hill came a ruined fortress of some sort. 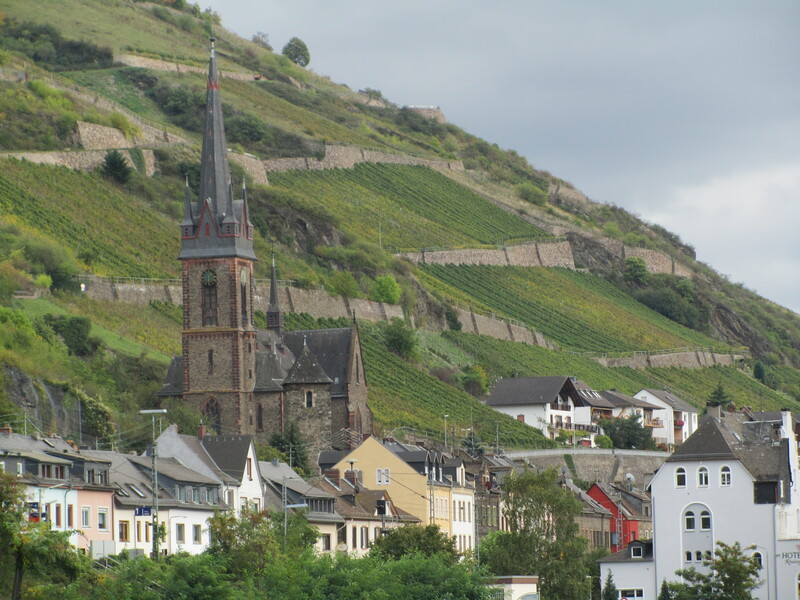 It wasnt until afterwards that I found out we were travelling along the Rhine. 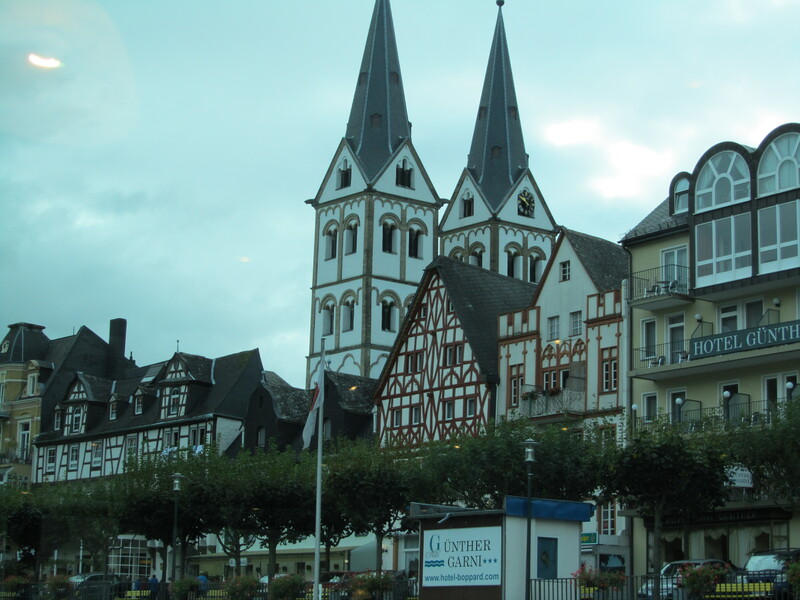 I was pretty keen to come back to this area again and that was one of the reasons we (I) chose Koln/Koblenz as our stop between Hanover and Paris. As you can imagine, not much had changed in the area in 3 years. There was still this amazing river with rolling hills on both sides that had vineyards growing all over them and then with every big hill came a ruined fortress. This time however my focus had changed a little. We were travelling a fair bit slower, there were no trees blocking the view and because of my interest in wine, I was intrigued by the vineyards themselves and how they were set out. We could even see a few of them out picking as it is getting towards the end of harvesting season. It was so nice just sitting on the nearly, empty boat watching some one of the most stunning areas in the world just go about its business being good-looking while we meandered past. The river weaved in and out of the hill, many of the larger ones with castles on top of them and a town at the base. The vineyards planted on the edge of these hills just seem stupid. Most of them are sitting at 45 degree inclines or more. I just can’t describe how much i loved this cruise. And so did everybody else. Enough that we decided to go right to the end which was a great decision as somehow it all only got better (plus I got a cat nap which i really needed). 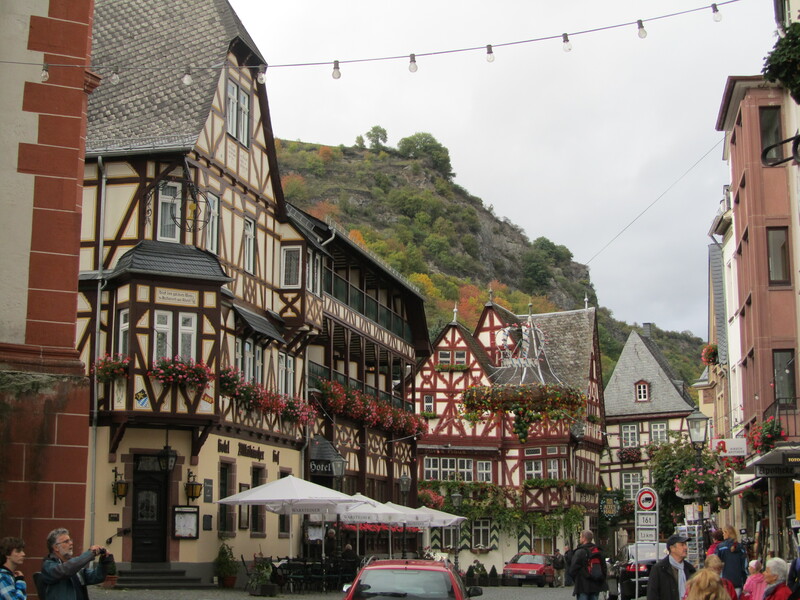 When we reached Bingen, we took a train to the town we had planned on getting off at called Bacharach. That’s the one Shoestring had recommended. Again, gooood choice. This was just a beautiful little wine town that would have been over crowded during summer but at this time of year there was no one.